Last month, I wrote about automatically cracking the Windows XP password with Ophcrack. In the article, I revealed the simplicity of downloading the Live-on-CD *.iso Linux distribution file and running it at the computer startup. But sometimes, it is not even necessary to obtain access to a locked Windows machine by that means. There are even easier ways to access an account in Windows XP. These methods do not even require any downloads or storage media (like CDs or floppy disks) to perform them. The only caveat is that these methods will never reveal the password. They will only reset and change the password to any combination that pleases you. Microsoft Windows operating systems – all built on or based off of the NT kernel – host several users other than the ones we see everyday like “Mom,” “Dad,” “Sister,” and “Brother.” You rarely ever notice “SYSTEM,” “NETWORK SERVICE,” or “LOCAL SERVICE.” But these unseen automated users work with us everyday to ensure that everything runs smoothly. Since every program cannot be run with a user executing it, the Windows kernel creates artificial users to run these processes. Want proof? Press Ctrl + Alt + Del (or “Start Menu,” “Run,” and “taskmgr.exe”). Then click the “Processes” tab. Make sure “Show processes from all users” is checked at the bottom. If your current user is in the “administrators” group policy, you can see these hidden entities. Want more proof? Go to the “Start Menu.” Click “Run.” Type in “control userpasswords2” and see what happens. You’ll probably discover the “ASPNET” user. Most of these hidden entities fall under the administrator group policy, which pretty much gives them full reign on your system. Their privileges are the Linux equivalent to the “root” user. By exploiting these hidden users, you can force them to change or reset (clear) the password of any other users or administrators. The “admin” method” is pretty straightforward. On many Windows XP systems, especially on the Home editions preconfigured by third-party OEM manufactures like Dell and Compaq, the installation creates a user called “Administrator” with, of course, administrator group policy privileges. It creates this user so consumers can fix what they’ve messed up if locked out of their accounts. This user can only be accessed in safe more. Conveniently, it is not password protected at all! Just restart the computer. In between the appearance of the BIOS POST screen and the Windows XP boot screen, alternate pressing Ctrl and F8. On the login screen, you should see “Administrator.” If you don’t, press Ctrl + Alt + Del twice and manually enter the “Administrator” in without at password. Once successfully logged in, go to the “Control Panel” and make necessary modifications to the user profiles. If you are stuck at any of these steps or if it flat-out does not work, you’ll have to switch to “Plan B” … not the morning after pill. There are many variations of this method. Basically, you gain control of the “SYSTEM” user, which is the highest user on the power hierarchy. The two main ones involve either the windows internal scheduling system or the screensaver. There are a couple of requirements for this method. First, you will need any type of user access, be it Limited User or Guest. Second, either the scheduling system has to be enabled or the screen saver has to be configured. Lastly, Windows cannot be patched. I’m pretty sure Microsoft would have plugged the hole since this discovery was a breakthrough in the tech world last year. The “AT” command schedules the operating system to run programs automatically. For example, if you want the operating system to make a backup of a crucial file or if you want the operating system to update the dynamic DNS provider with the current IP address, “AT” is at your command. It is the windows equivalent to the *nix cron command. The loophole is who runs the program when it is time to execute it. The “SYSTEM” user runs the command instead of the original user. So, if you schedule the OS to run “cmd” in the next minute, you’ll get the console DOS prompt for the “SYSTEM” user. 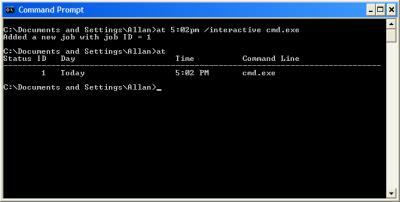 In the command prompt type “at 4:25pm /interactive cmd.exe” replacing the time with the next minute. When the new command prompt appears, type “net user username password” replacing “username” with your target user and “password” with the password combination that you want to set. When it is time for Windows to display the screen saver, the SYSTEM runs the screensaver file (which is pretty much an *.exe file renamed *.src). If you replace the default screensaver file with the cmd.exe file, again, you will obtain access to the “SYSTEM” console. The next time the screen saver is supposed to run, the command prompt will display. Then you can type “net user username password” replacing “username” with your target user and “password” with the password combination that you want to set. If you still are unable to crack the password. It’s time to bust out a CD and burn Ophcrack. Read my previous article on the specifics. But if your file system is an EFS (encrypted file system), you’re pretty much out of luck. The file system is encrypted with the Windows password. If you reset the password, you loose access to the files. Sorry, but that’s the way the cookie crumbles! Good Luck! If you have any problems, check my references. This entry was posted on Thursday, March 15th, 2007 at 4:18 pm	and is filed under Grey Hat, Impress Your Friends, Passwords and Keys, Windows. You can follow any responses to this entry through the RSS 2.0 feed. Both comments and pings are currently closed. This is quite a nice loophole here. I’m speaking of course about the “AT” command loophole. However, you can completely disable the “Task Scheduler” service through the Administrative tools in your Control Panel as I’m sure you already know. This, in turn, will disable all scheduled tasks you may have, but if you not have any scheduled tasks, I suggest disabling that service to prevent any unauthorized use of your computer through this loophole. I have a question for you. A friend gave me his old computer (a compaq s6000cl) and I tried to start it up and it wouldn’t even turn on. So I opened it up and just looked around. A cord inside was loose so I pushed it in and then tried re-starting it. Well, it WORKED! When I first start up the screen is black and say “please select the operating system” etc and gives the options of Windons EX Professional, Windows XP Home Edition, or Windows Recovery Console. I tried the second one and it said I needed to re-install windows. So I tried the first option. It then came up with a screen to log in only as the admistrator…. I called the previous owner and asked what that password was and they had NO CLUE! So I called the COMPAQ support center and they said the warranty was out of date and that I’d have to pay $50 – $100 to fix the problem. I don’t have the funds for that. I just want to play with the computer. I don’t care if I have to format the entire hard drive and have it restored to the factory settings. I just want to be able to do SOMETHING with this computer…. you cannot clean the computer without the password. As in clean, I mean go into Windows XP and clear all the files. If you’re talking about reinstallation or installation of another OS, you don’t need the password. just read my other article about ophcrack. it will automatically crack the password in minutes. no new command prompt comes up it says something like “add new job to =1” and when i enter the nxt coomand the password doesn’t come up so can you tell me what to do? Hello, i really, really need help! I was playing with “control userpasswords2” menu and i accidentally changed my account type to Help_Asisstant from an Administrator account. The problem is, that I’ve logged on as the administrator and couldn’t find my regular account to change it back. I’ve tried using “cmd” and “control userpasswords2” again but i can’t find my account there and i’ve also tried the easy way by going through control panel and user accounts. alex my only suggestion is to log on in safe mode in the administrator username and try to change it from there. Ibro, I believe that Microsoft patched that hole already. Sorry! I presently having problems loggin into Wondows Xp Professional, at welcome screen under my user I entered my password and it goes into loading users settings and right into loggin off user, it does the same thing under guest, have tried the ctrl+alt+del twice, and on Admin login, I leave it blank and it does the same thing, I have tried many suggestions, but still having the same problem, it does not let me into windows at all, I even tried safe mode and it does the same thing, one thing I have taken noticed, under recovery console on C:\windows\System32 I don’t see the userini file, I’ve checked all directories and no where to be found, can any one please advice on what can I do to bypass this login window…. thank you Thomas. i access only user account. how can i access admin. i tells you that user is a limited account. hey i would like some help please. well i dont know that admin info, and i can only get on limited account which wont let me download anything like that ophcrack thing. so someone told me u can do it with safe mode how do i get to that? i have done it before but forgot what to do, something like during boot up hit f4? Very helpful advice!!! Worked great, recovered my password for WinXP in minutes!!! Thank you very much!!! Hi there is there any data based programmer in here i really need one……. Another way is to create a “temphack2” folder (in addition to “temphack” folder, & after putting copies of the 2 files in temphack fldr), then put a copy of cmd.exe into temphack2 foldr, rename cmd.exe to logon.scr –> then COPY or MOVE it back into system32 folder (can do in explorer) – it will OVERWRITE the logon.scr, effectively deleting the original WITHOUT IT BEING IMMEDIATELY PUT BACK!! Yea I tried your logon.scr thingy and now its telling me in run can not find the cmd file how do I reverse this please it was not usefull at all to me ? but im still not gettin any help that I need I don’t have a OS disk I forgot the password for my admin there is really no going around it is there ? PM (4:25 PM = 16:25). i have a sony laptop that a friend gave to me and it has a password restriction on the first load up screen (which says log on to windows-windows xp pro) it has a username already on it but i have no idea what the password is. i cant get on to the computer using safe mode. is there anyway i can ‘hack’ into a default user or change the password without logging on to the computer? for my sister in law and i,now we fix the problem.again THANK YOU SO MUCH. Thanks for all the options but I have tried all of these but it says that the administrator is “ME” !! but when I type my name in is says that it cannot detect it. Umm…. Is there a way to do this WITHOUT resetting the password? With no third party things? i would like to format may laptop but everytime i go to bios it requires password,what shall i do? …you don’t need temphack folder! Be sure to be fast enough, you can copy and paste all the lines together, last return carriage included (so cmd runs them in fast sequence). Windows will automatically detect that this is the right file and backup it again in its dllcache folder. Long time ago , I confronted with the similar problem. 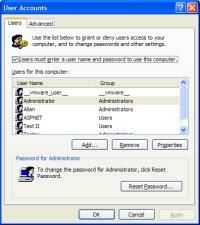 Finally , my friend Jane introduce the Windows password Reset.It help me access windows. It’s worth a try! my favorite is using software to reset windows password ,i found windows password unlocker in internet a couple days ago,it is very convenient for windows password recovery. there are lots of software for password recovery on the internet. plan a worked like a charm, you are the best. thanks. I usually use the Windows Password Reset Kit 1.5 to reset Windows password, It worked great for me, with no reinstall and no data loss.